When this is being written, I am reading Scott L. Mingus Sr.’s Confederate General: Gov. William “Extra Billy” Smith: From Virginia’s Statehouse to Gettysburg Scapegoat. Extra Billy is quite a character. He was a businessman, politician and the oldest Confederate generals at Gettysburg. His actions late on the first day at Gettysburg constitute one of the “if only” stories for that battle. The second new Scott L. Mingus Sr. book on the shelves this month is Echoing Still: More Civil War Voices from York County, Pa. This one is co-written with James McClure, with the editor of the York Daily Record. The book includes excerpts from dozens of newly discovered letters and diaries of York County residents. While the focal point is the 1863 Gettysburg Campaign, the book starts in the slave era and runs through the GAR meetings of the late 1800s. Last Battle of Winchester by Scott Patchan is a book that is worth reading. Sitting on top of my “to read” pile is Kennesaw Mountain: Sherman, Johnston, and the Atlanta Campaign by Earl J. Hess from The University of North Carolina Press. UNC always does a good job with Civil war books and this is no exception. An excellent author, 21 maps, 25 illustrations and a full set of notes, appendices, bibliography and index makes for an excellent history. Chancellorsville’s Forgotten Front by Chris Mackowski and Kristopher D. White is going to be a real step forward in this battle’s history. Chancellorsville is much more than Jackson’s attack and wounding. John Sedgwick’s Sixth Corps fought two battles in and near Fredericksburg. CALAMITY AT CHANCELLORSVILLE: The Wounding and Death of Confederate General Stonewall Jackson by Mathew Lively is a detailed look at the truth and the myths surrounding this event. THE LAST DAYS OF STONEWALL JACKSON: The Mortal Wounding of the Confederacy’s Greatest Icon by Chris Mackowski and Kristopher White is another look at this event. James S. Humphreys’ Edifice of Freedom: The Civil War Amendments in Historical Perspective looks at the historical context in which each amendment came to fruition and then traces the evolution of the amendments and their impact over time in American life. Steven J. Ramold looks at the wide array of factors preventing the Union Army and the civilians on whose behalf they were fighting from being a united front during the Civil War. Across the Divide: Union Soldiers View the Northern Home Front illustrates how the divided spheres of Civil War experience created social and political conflict far removed from the better-known battlefields of the war. 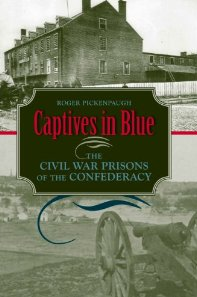 Captives in Blue: The Civil War Prisons of the Confederacy completes Roger Pickenpaugh’s earlier groundbreaking book Captives in Gray: The Civil War Prisons of the Union, rounding out his examination of Civil War prisoner of war facilities. They missed the February publication date. The Lincoln Assassination: Where Are They Now? – A Guide to the Burial Places of Individuals Connected to the Lincoln Assassination in Washington, DC by Jim Garrett and Richard Smyth. The audio book edition of The Queen of Washington, narrated by Judith Cullen is available. This is not an abridged edition and runs about ten hours. GENERAL GORDON GRANGER: The Savior of Chickamauga and the Man Behind “Juneteenth” by Robert Conner looks at the general who acting as a gunner at Chattanooga incurred Grant’s displeasure. There is a lot more to Granger than that one incident and this book tells us about it. 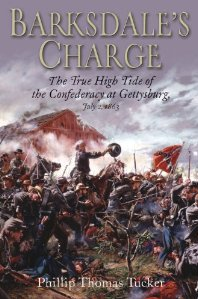 Barksdale’s Charge: The True High Tide of the Confederacy at Gettysburg, July 2, 1863 by Phillip Thomas Tucker is a history of Barksdale Mississippi Brigade on the afternoon of July 2, 1863. Their charge late in the day was “the grandest charge I ever saw” according to many witnesses. Barksdale’s Charge almost pushed the Army of the Potomac off Cemetery Ridge. While Pickett’s Charge receives history’s attention this could be the closest Lee came to breaking Meade’s line at Gettysburg. A SEASON OF SLAUGHTER: The Battle of Spotsylvania Court House, May 8-21, 1864 by Chris Mackowski & Kristopher D. White turn their considerable talents from Fredericksburg to Spotsylvania. Atlanta, Cradle of the New South Race and Remembering in the Civil War’s Aftermath by William A. Link argues that the city defined the broader meaning of the Civil War in the modern South is due on the sixth. Lee’s Army During the Overland Campaign: A Numerical Study by Alfred C. Young III provides accurate information regarding the Confederate side throughout the conflict. The book shows Lee’s army was larger and suffered higher casualties than popular history says. 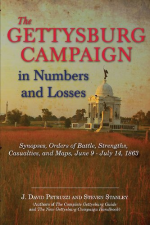 The Gettysburg Campaign in Numbers and Losses: Synopses, Orders of Battle, Strengths, Casualties, and Maps, June 9 – July 14, 1863 by J. David Petruzzi and Steven Stanley looks at more than three dozen engagements both large and small waged during the five weeks of the Gettysburg Campaign. A synopsis of each engagement, over three dozen, includes photos of the commanders, an original full page map of the fighting, an order of battle with numbers and losses (including killed, wounded, captured, and missing), charts and graphs of relative strengths and losses, a conclusion of how the fighting affected each side and the course of the campaign. Joshua L. Chamberlain: The Life in Letters of a Great Leader of the American Civil War by Thomas Desjardin, uses 300 never-before-seen letters from sent by or to Chamberlain from his college years in 1852 to his death in 1914. ROBERT E. LEE IN WAR AND PEACE: Photographs of a Confederate and American Icon by Don Hopkins is a detailed look at Lee through photographs taken of him. This is both a look at Lee’s life and a look at the early art of photography. The Battle Hymn of the Republic: A Biography of the Song That Marches On by John Stauffer and Benjamin Soskis look at one of America’s most enduring songs. GENERAL GRANT AND THE REWRITING OF HISTORY: How a Great General (and Others) Helped Destroy General William S. Rosecrans and Influence our Understanding of the Civil War by Frank Varney. The book argues that Grant was a poor judge of character as demonstrated during his presidency and as a businessman. This lack of judgment did not develop after the war but was a lifelong character trait. Looking over an “Advanced Reading Copy” shows a thorough review of the Grant/Rosecrans relationship. If the book will change anyone’s mind is an open question. In either case, this looks like an interesting read that deserves your consideration. Stephen M. Hood, a collateral descendent of General John Bell Hood, is the author of John Bell Hood: The Rise, Fall, and Resurrection of a Confederate General. The author presents the idea that Hood is not the “lost his mind at Franklin” general of popular history. Looking through an “Advanced Reading Copy” shows the author supports his premise with logic and facts. If the book can or cannot change your mind is an open question. In either case, this well-written book deserves your consideration. Remembering the Civil War: Reunion and the Limits of Reconciliation by Caroline E. Janney looks at the people who live during the war and how they felt about things after it. The Gentlemen and the Roughs: Violence, Honor, and Manhood in the Union Army by Lorien Foote looks at the clash when educated, refined, and wealthy officers (“gentlemen”) found themselves commanding a hard-drinking group of fighters (“roughs”). Do not dismiss this as “another Gettysburg guide book” A Field Guide to Gettysburg Experiencing the Battlefield through Its History, Places, and People by Carol Reardon and Tom Vossler. The authors have excellent credentials. Carol Reardon is the author of several unique books, while Tom Vossler is an excellent guide. This is a 460+ page guide with 47 maps, 75 color and 59 black & white illustrations is nicely priced at $22. The Battle of Big Bethel: Crucial Clash in Early Civil War Virginia by J. Michael Cobb, Ed Hicks, and Wythe Holt id the first full-length treatment of this small but consequential June 1861 battle. Surgeon in Blue: Jonathan Letterman, the Civil War Doctor Who Pioneered Battlefield Care by Scott McGaugh looks at this important person in battlefield medicine. The Civil War, State by State by Chester G. Hearn looks at the war from the perspective of the states and territories covering both military and political considerations. The Petersburg Campaign: The Western Front Battles, September 1864 – April 1865, Volume 2 by Edwin Bearss and Bryce Suderow is a “must have” book. This is 504 pages with original maps by Civil War cartographer Steven Stanley. Lincoln’s Citadel: The Civil War in Washington, DC by Kenneth J. Winkle looks at the city undergoing the stress of war. Black Slaves, Indian Masters: Slavery, Emancipation, and Citizenship in the Native American South by Barbara Krauthamer is going to surprise a number of people. This is a book that I am looking forward to reading. The Long Shadow of the Civil War: Southern Dissent and Its Legacies by Victoria Bynum shows that the CSA was not a unified political nation. This book looks at North Carolina, Mississippi and Texas to show how many internal problems existed in the CSA. THE CIVIL WAR LOVER’S GUIDE TO NEW YORK CITY by Bill Morgan tours Civil War New York, places, buildings and monuments that grace the city. This looks to be great fun for everyone and a new Civil War tour. American Civil War Guerrillas: Changing the Rules of Warfare (Reflections on the Civil War Era) by Daniel E. Sutherland looks at how this type of fighting influenced the armies and the war. Earl J. Hess’ 3-volume study of field fortifications late in the war is being released as paperback books. The Northern Home Front during the Civil War (Reflections on the Civil War Era) by Paul A. Cimbala and Randall M. Miller covers the geographic breadth of the diverse northern home fronts during the Civil War. The Green and the Gray: The Irish in the Confederate States of America by David T. Gleeson looks at the Irish in who supported the CSA, their reasons and the affect the war had on them. Vicksburg, 1863: The Deepest Wound (Battles and Leaders of the American Civil War) by Steven N. Dossman look at these two important events. Smithsonian Civil War: Inside the National Collection is a coffee table book released for the 150th that looks at some of the items in their collection. Last of the Blue and Gray: Old Men, Stolen Glory, and the Mystery That Outlived the Civil War by Richard A. Serrano looks at the last two Civil War veterans and the questions that outlived them. SECOND DAY AT GETTYSBURG, THE: The Attack and Defense of the Union Center on Cemetery Ridge, July 2, 1863 by David Shultz and David Wieck expands on the critically acclaimed The Battle Between the Farm Lanes. The book is a completely revised and expanded study, with new photographs, original maps, and a self-guided tour of the fighting. History Press expects to publish Robert Redd’s St. Augustine: America’s Oldest City in the Civil War in the spring of 2014. Yankee Dutchmen under Fire by Joseph Reinhart is due this fall. Ethan Rafuse and Charles R. Bowery Jr. are working on a War College guide for Richmond-Petersburg expected in 2014. Steve Stanley and J. David Petruzzi are hard at work on The Complete Antietam Campaign Guide. Antietam Chief Historian Ted Alexander is penning the Forward. This is a full color book styled on The Complete Gettysburg Guide. The book will feature Harpers Ferry, South Mountain, Antietam, and Shepherdstown plus many points in between. This will be part of a trilogy for Maryland Campaign – a Guide, a Handbook, and a Numbers and Losses volume. The format is “just like” the Gettysburg series. Buckeyes Forward: Ohio Troops in the 1862 Maryland Campaign is Eric Wittenberg’s current project. The book covers the Ohio units at South Mountain, Harpers Ferry, and Antietam. A second major section covers the actions of two future presidents of the United States, Hayes and McKinley. Followed by a series of profiles for other prominent Ohio officers including George Crook, Hugh Ewing. Rufus Dawes, Ohio-born Confederate brigade commander Brig. Gen. Roswell S. Ripley and the Ohio regimental commanders. Last is a look at the three Ohio soldiers who won the Medal of Honor valor during the 1862 Maryland Campaign. The book will have a large number of photos and maps. Savas Beatie is the expected publisher. Another project Eric Wittenberg is working on The Battle of Yellow Tavern: Jeb Stuart’s Last Battle. 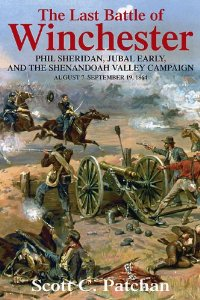 This will be a study of Phil Sheridan’s May 1864 raid on Richmond, with particular focus on the May 11, 1864 Battle of Yellow Tavern, where Jeb Stuart is mortally wounded. The History Press is the expected publisher. James M. McPherson will be at the New York Public Library Mid-Manhattan Library on May first at 6:30 PM. On June 25th, at 6:00 PM, he is at the Filson Historical Society, Louisville, KY.